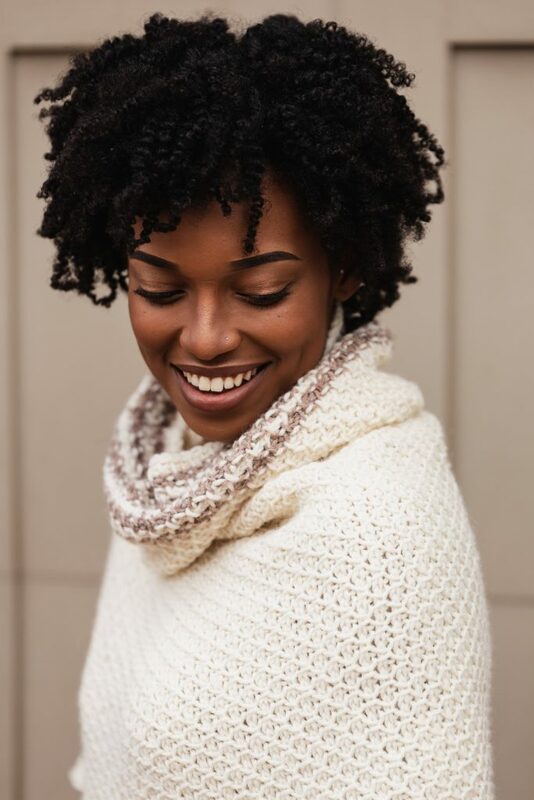 Flex your Tunisian crochet muscles to make the perfect cold weather layering piece, the sweet and simple Hot Cocoa Poncho! Here in Ohio, March means spring is on the horizon. The snow doesn’t stick anymore and we have more sunny days than gray days. But I won’t be fooled – it is still super cold outside. That means I have to wear all of my layers. I don’t mind, especially when I have a Hot Cocoa Poncho hanging in my closet. And thanks to my friends at JOANN, you can too by using the FREE pattern below! This post contains affiliate links that support TLYCBlog content. All opinions are my own. Read my full Privacy and Disclosures statement HERE. 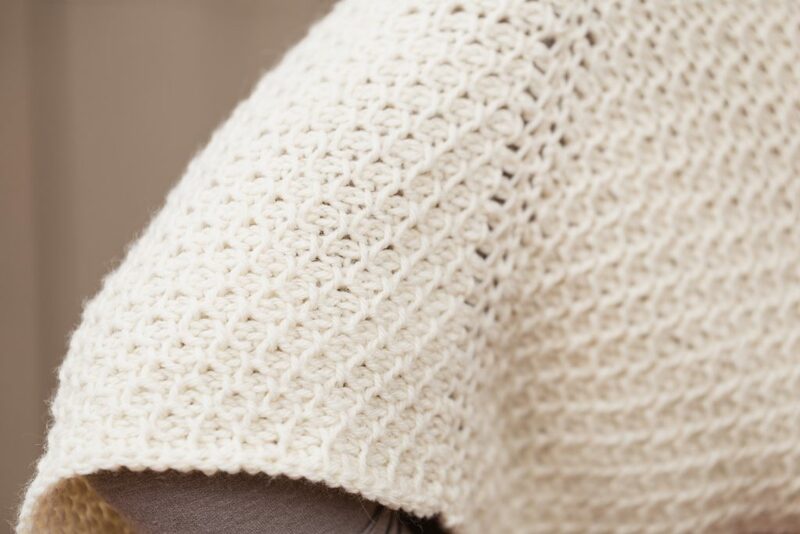 Find a printer friendly, PDF version of the Hot Cocoa Poncho in my Ravelry Shop and on TLYarnCrafts.com. PDF version includes full-color, 5 page instructions and additional helpful photo supplements. 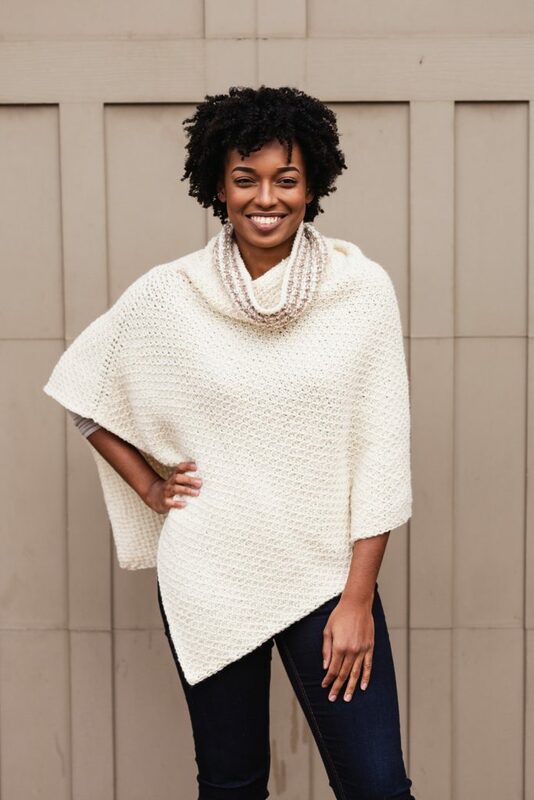 I’ve always loved the idea of ponchos and I’m so excited to finally add one to my crochet pattern library! The Hot Cocoa Poncho was inspired by a friend from my old job. Our office was always so cold and we weren’t allowed to have space heaters. My friend kept the most gorgeous wool poncho on her chair and would wear it all day when it was especially chilly. 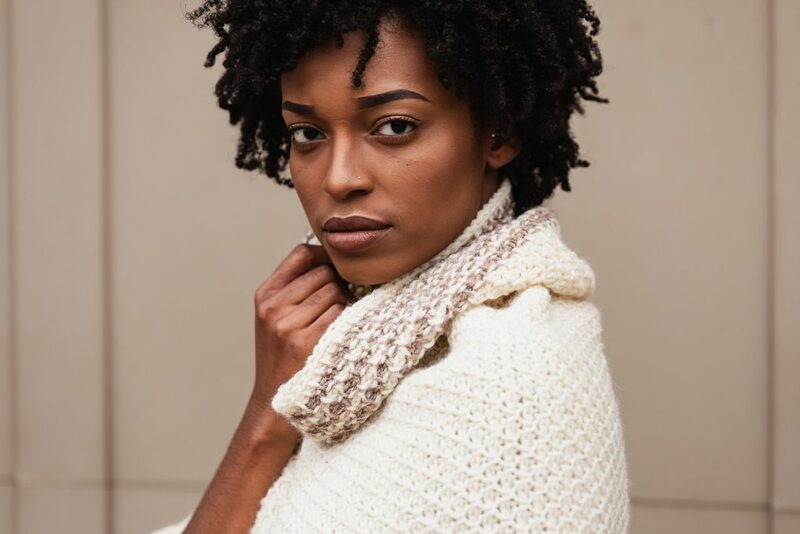 The Hot Cocoa Poncho was designed to serve the same purpose – it’s there when you need it, lightweight but warm, and it won’t get in the way like an oversized wrap or blanket might. The most endearing quality about ponchos is how versatile they are. Since I finished one for myself, I’ve worn it for quick trips to the post office or the grocery store, I’ve gone casual with jeans and booties for coffee with friends, and I even wore it over a basic dress for church. A piece like this really makes you feel put together, even if you have to run out because you forgot the milk. 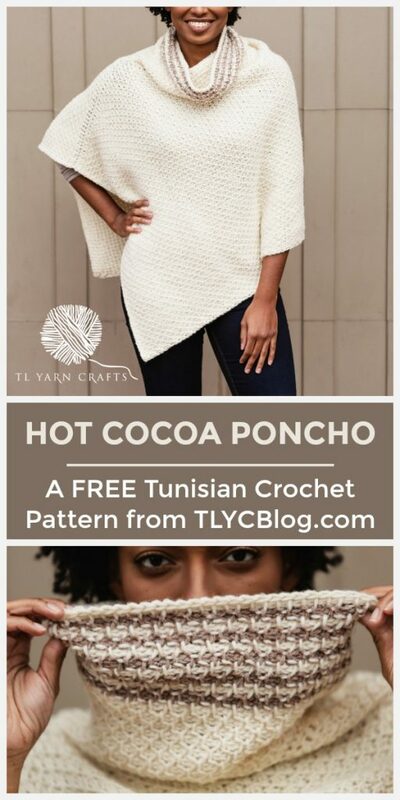 Instead of using traditional crochet, I decided on Tunisian crochet (TC) for the Hot Cocoa Poncho. 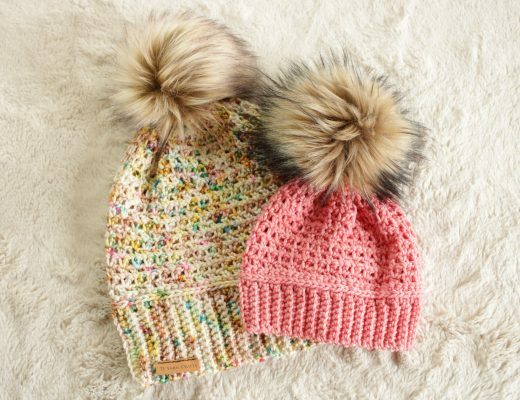 This choice gave me a whole different stitch collection to choose from. I landed on the Honeycomb Stitch, which is one of my absolute favorites. It creates a beautiful texture without being complicate or distracting from the overall aesthetic. If you’re new to Tunisian crochet, give this technique a try! Click here for a full beginner-friendly video tutorial series on Tunisian crochet. I paired this subtle pattern with Lion Brand’s Wool-Ease yarn that I picked up from my local JOANN store. Just like the Honeycomb stitch, Wool-Ease yarn elevates whatever project you use it for. 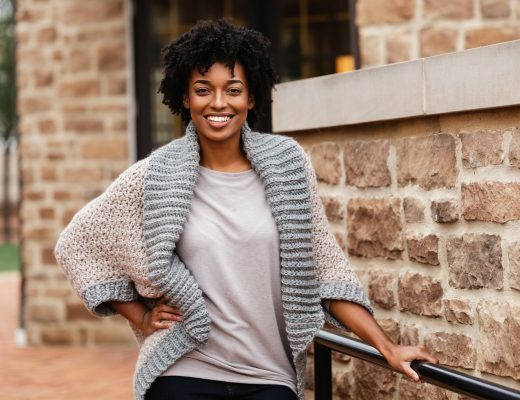 It’s clearly a favorite of mine, considering I’ve used it for so many designs like the Sweet Gingham Baby Blanket and the Sweater Weather Cardi. Picking a color combination of Wool-Ease yarn for the Hot Cocoa Poncho sample was really tough. I decided on a classic combination – Fisherman for the Body and Mushroom for the accent stripes in the Cowl. The overall effect is relaxed and blends seamlessly into any outfit. 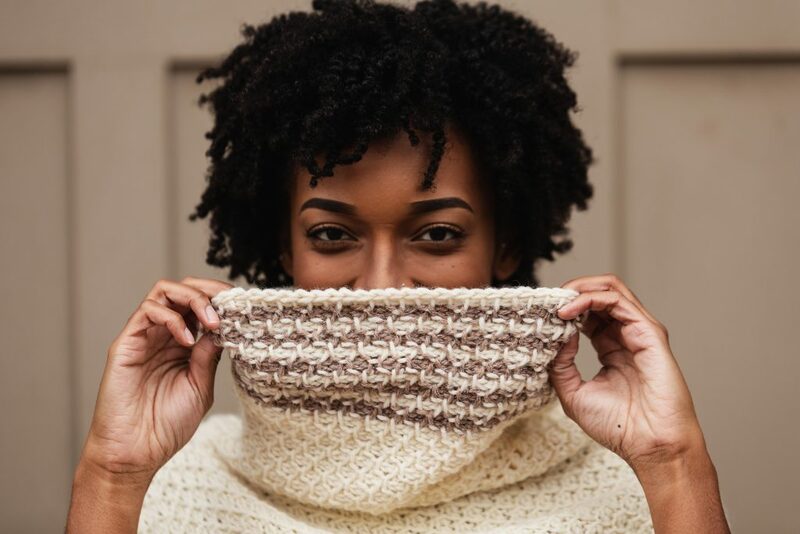 I’m sad to say, the Mushroom color from the Wool-Ease collection has been discontinued, but you can easily swap it out for Heather Gray or even Navy to play up the neutral color scheme. 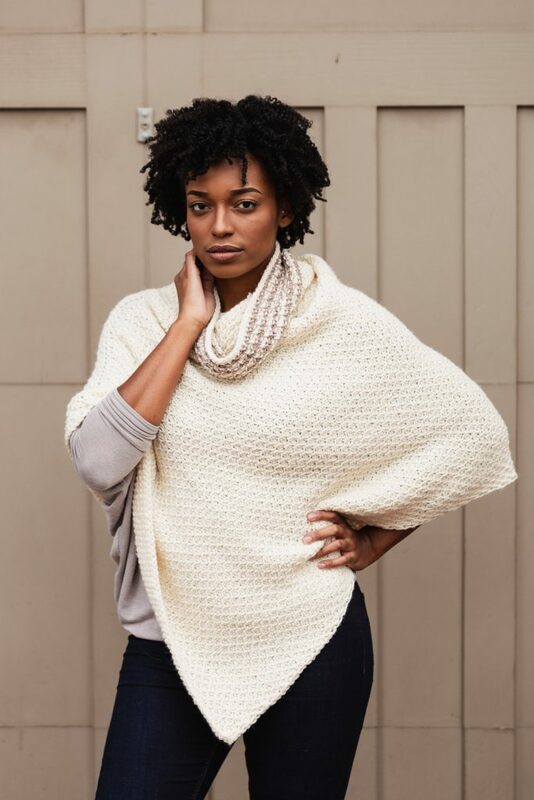 The Hot Cocoa Poncho is constructed from just two rectangles – the Body and a Cowl, which is accented with stripes. I designed this pattern using a large 8mm corded Tunisian crochet hook (find my favorite corded TC hooks here!) to make the resulting fabric light and air with great drape. 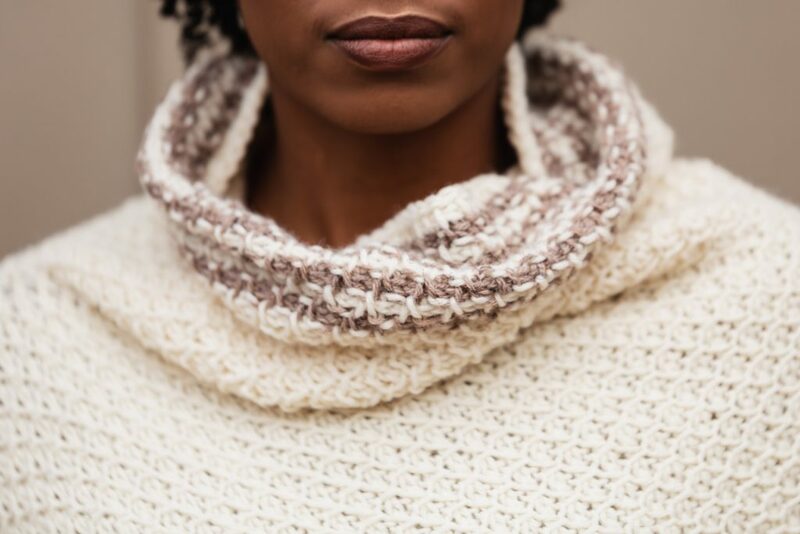 The striped cowl adds warmth and style to the whole piece. 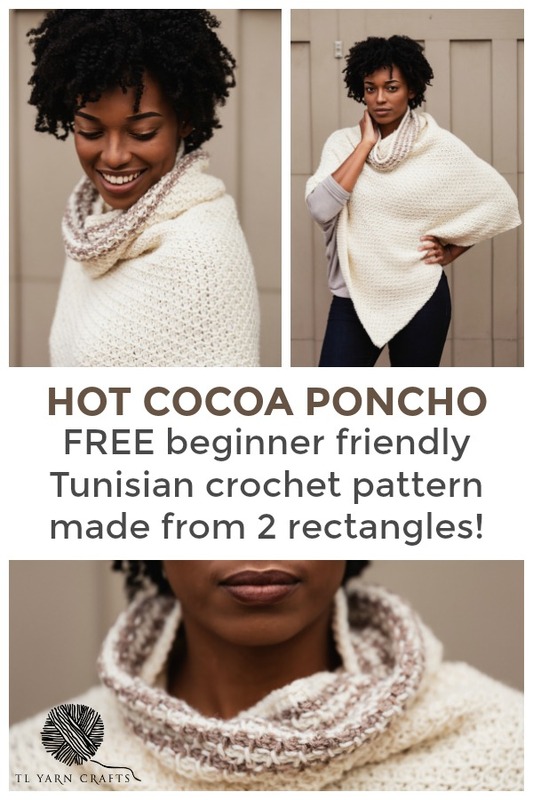 If you’re ready to make your own Hot Cocoa Poncho, keep scrolling for the FREE pattern, or pick up a PDF copy from TLYarnCrafts.com! Click to PIN this Post! 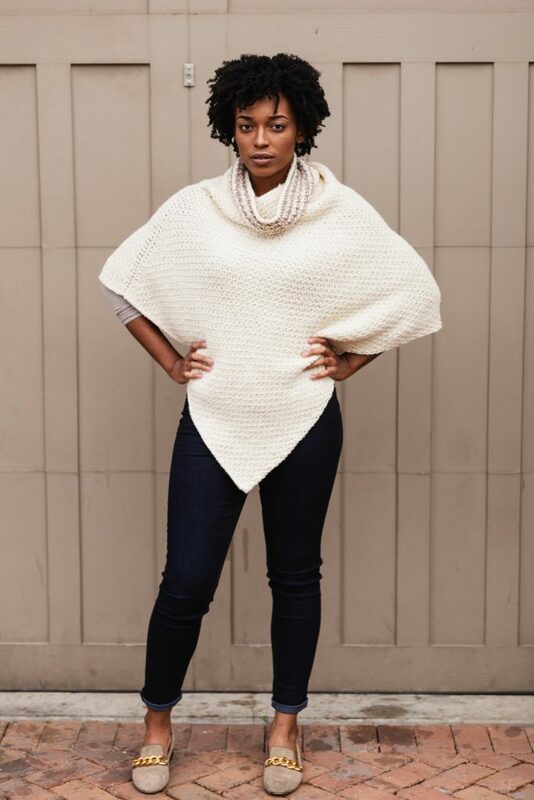 Click here to buy the beautifully formatted Hot Cocoa Poncho PDF pattern. Pattern is written for size S/M with sizes L/XL and 2XL/3XL in parenthesis. Pattern rows are Forward pass instructions. The loop already on the hook at the beginning of the row counts as the first st. Always tss in the last st of the row, being sure to work under both loops of the st.
Return Pass: Follow the foundation row and each row with the Return Pass in the same color. Return Pass Instructions: Ch 1, *yarn over, pull through two loops; repeat from * until 1 loop remains on hook. Foundation: With A, ch 70 (82, 102), pull up loop in back bump of the 2nd ch from hook and all remaining chs. Row 1: (Tss 1, tps 1) across row. Row 2: (Tps 1, tss 1) across row. Foundation: With A, ch 76 (82, 88), pull up loop in back bump of the 2nd ch from hook and all remaining chs. Rows 3-12: Repeat Rows 1 and 2. Rows 13-22: Repeat Rows 1 and 2, with Row 1 repeats done in Color A and Row 2 repeats done in Color B. Row 23: With A, repeat Row 1. Finish with sl st bind off. Cut yarn leaving a very long tail. Step 1: Fold Body bringing points A together. Step 2: Seam from Point A toward Point B until 12 (12.75, 13.75)” from fold. Step 3: Seam short sides of Cowl together, matching up the stripe colors. Step 4: Seam Cowl to Body, ensuring seam of Cowl is at point C.
Step 5: Weave in all remaining ends. Steam block as needed. 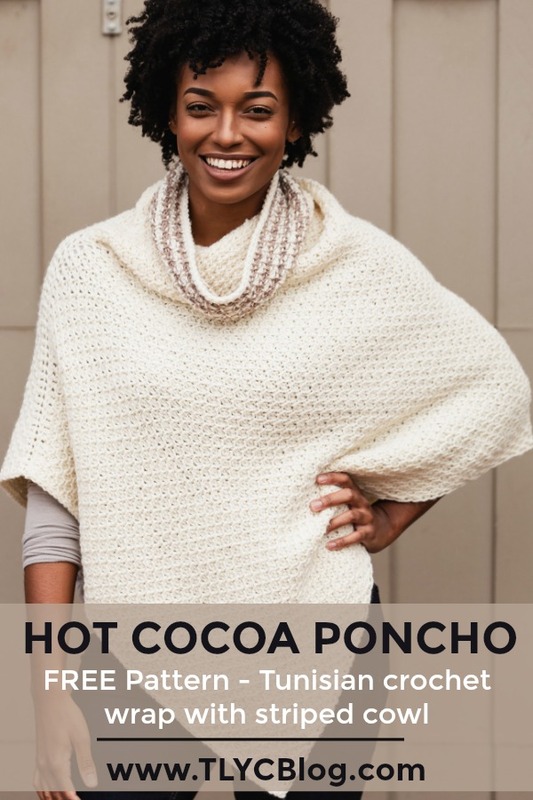 Share your Hot Cocoa Poncho with me on Instagram using #HotCocoaPoncho and #TLYCMakers for a chance to be reposted. And be sure to join my Facebook group, TLYCMakers, so we can see your poncho too! Oh wow Toni, this is gorgeous! I’ve recently fallen in love with Tunisian & this makes me want more. I’m allergic to wool, any suggestions for a yarn that you think would get the delicious drape this one looks to have? Thanks, that sounds great! Can’t wait to get started!